Hip dysplasia is the malformation of the hip joint. Akitas are prone to general progressive retinal atrophy which causes dogs to slowly lose their sight. This is due to the degeneration of the retina and cannot be cured. They are also susceptible to entropian and ectropian which is where the eyelid rolls either in or out on itself, causing pain for the dog and leaving the eye open to damage. The breed is susceptible to some auto-immune diseases including hypothyroidism, a deficiency of the thyroid hormone, and sebaceous adenitis, a skin disease which is caused by an auto-immune deficiency. Kennel Club Assured Breeders of Akitas must use the British Veterinary Association/Kennel Club hip dysplasia scheme. Breeders should only breed from dogs that have a hip score well below the breed mean score of 10. Kennel Club Assured Breeders are strongly recommended to use the British Veterinary Association/Kennel Club/International Sheep Dog Society eye scheme. The tests detect eye problems, particularly general progressive retinal atrophy. Akitas are very intelligent and confident. The breed is loving and protective. They make good pets for families - ideally with older children. Never leave children unsupervised. Always seek advice from the breeder. 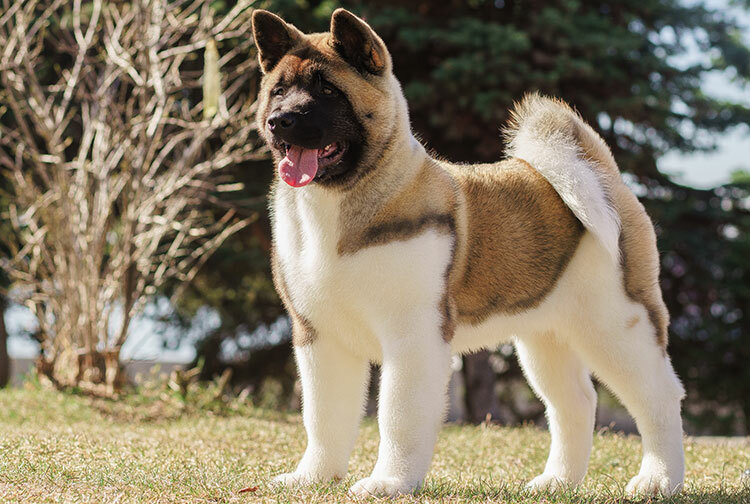 Akitas have specific needs best suited to experienced dog owners. The breed is naturally dominant with other dogs, although they can live with other dogs if well socialised and disciplined. They thrive on human company, and so are not recommended for people who are out all day. If left for too long they can become destructive. The Akita is a large dog who needs a large house and a reasonable-sized secure garden to play in. They are an active breed but will enjoy snuggling up on the sofa too. Owners should be careful not to over-exercise young puppies. Once mature, an Akita will need around two hours’ exercise a day. The breed is intelligent and picks up training quickly. Training sessions should be short and interesting to keep them interested — otherwise they will just ignore you. They need a good brush once a week. Akitas shed their coat, usually twice a year. During this time they will need more regular brushing and bathing. This lasts for six to eight weeks until their new coat grows through. Cannot be let off the lead. Not suitable for first-time owners. The Akita and Japanese Akita Inu are two different recognised breeds, having separated from each other in 2006. The breed originated in Japan more than 350 years ago.